Let the "Big Boy" Out! 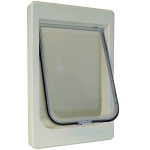 The PetSafe 4 Way Locking Cat Flap is ideal for any cat or small dog owner. This door is well crafted and will last a lifetime. 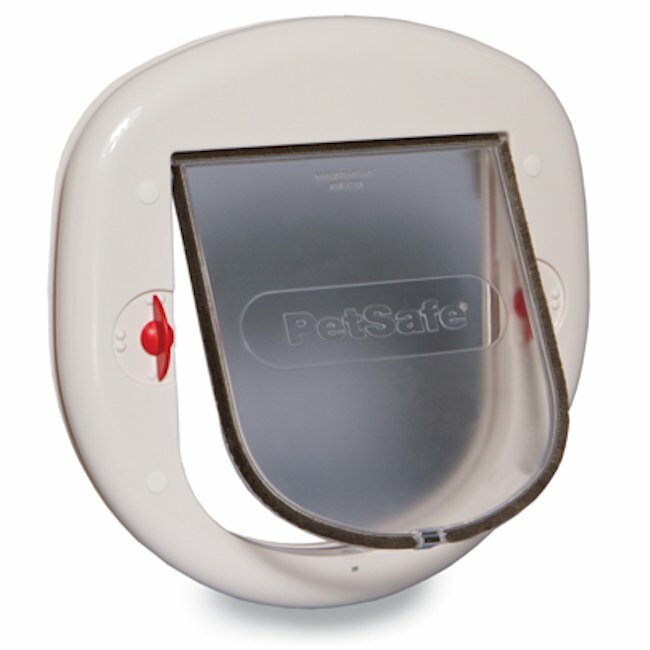 It provides peace of mind by allowing you to give your pets the freedom to enter and exit the house as they please. Bad weather or unsafe conditions outside are not a problem either. 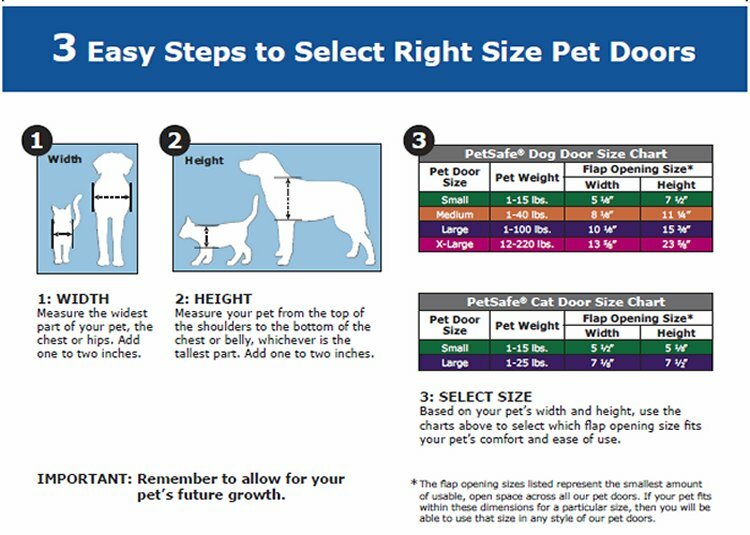 You can enable the lock to keep your pets in our out. Set it to In only, Out only, Fully unlocked, or Fully locked. 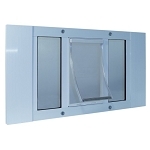 This door features a see-through rigid flap and 4-way security locks. 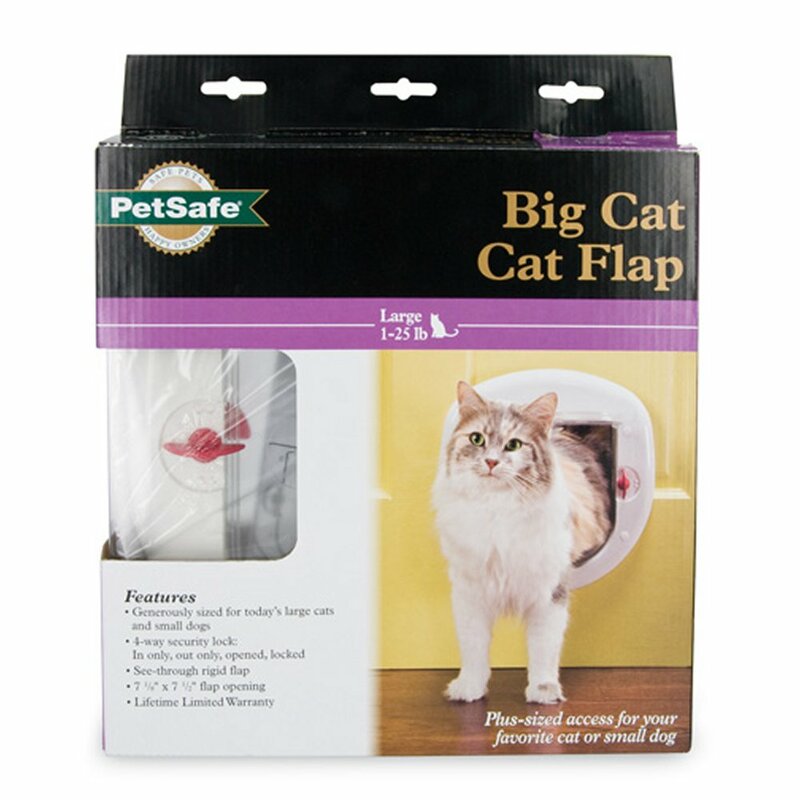 Flap Opening: 7 1/8" x 7 1/2"
Once I showed the cat how to use it, she now rips in and out of the garage. I like the door alot. So do all my cats. It works great. Sturdy easy to install. Didn't think I would find a replacement door after my cats broke the original one. It was exactly the one I needed to go on the frame that fits in my window! Thanx so much! Great product once you find out how to install it!!! OK, we need to stop with the pictures for installation, REALLY???? After calling for help and finding out that they, the company, recommend watching youtube for clear instructions, thats what I did. It was not as hard as it seemed and I have to say I did a better job with it than my contractor did with the first one I bought!! My cat is very strong and managed to get stuck in the first one trying to escape!! I'd tell my friends to buy this one! The narrow bladed jig saw worked best to cut the holes. One in a metal door and one in a wooden door. So far they are working great. This was a replacement for one we bought about 5 years ago that just wore out. We originally bought he window kit which I guess is no longer available. This just fit right in the hole and the cats can now go out on the screened in porch with a new door. 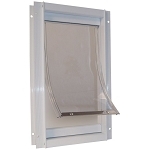 The size of the door is why we chose this product but because it was for door installation and not a wall installation we had to devise our own "tunnel" to connect the doors thru a 5 inch wall. But we did it with a thin sheet of aluminum and made our own extension. Now at least three of our five felines are happy! The other two aren't too sure about the "door to the other side".